“Want you to come in my kitchen and not my kitchenette. Want you to come in my dining room, not my dinette yet”. So my interpretation of it, that was confirmed by the menu, was that it was an American brasserie inspired by French brasseries. Yes, at Frenchette, Riad Nasr and Lee Hanson, known for their collaboration with Keith Mc Nally at Balthazar, Pastis and Minetta Tavern to name a few, created an interesting menu, taking French classics and giving them their own twist like the duck frites that, is a good fusion of two classic brasserie dishes: duck (usually confit) and steak frites. Rest assured that you can still get steak frites at Frenchette and I bet that the fries are as good as at Minetta Tavern, where I consider them to be the best. What really excited me was the use of ofal like tongue, liver or kidney that is a bold move for a restaurant, lots of people finding these parts gross but being an intricate part of French gastronomy. So I started my meal with their tongue and mackerel salad that was composed of veal tongue, more common in delis as well as mackerel, a fish not that many people like because of its distinct taste and that I used to eat from a can when I was a kid, my parents rarely buying fresh ones. It was like a surf and turf with that was quite good, each element complementing the other well. 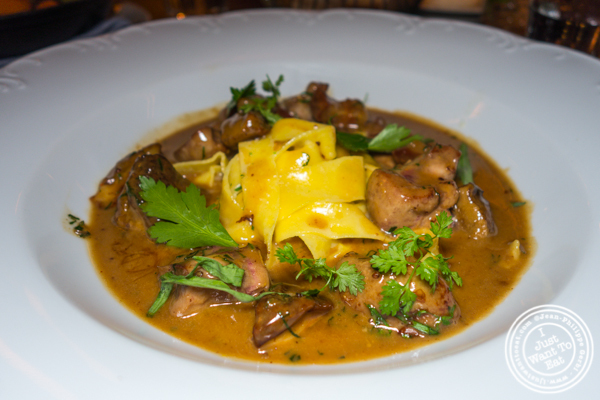 Then, I got the veal kidney in mustard sauce with fresh pasta. I could not resist ordering this over the duck because I love veal kidney and you also rarely see them on restaurants’ menu. It is not that easy to prepare as they need to be cleaned well and well cooked since if overcooked they will be dry and rubbery. These were perfect, in a succulent sauce that was however a bit salty. For Jodi, having a vegetarian meal was a bit more challenging. This kind of restaurant can accommodate if you ask but it is not the best way to make vegetarians feel welcome. So we shared the tortilla that had normally trout roe (so it was without but still superb as melting in our mouths), as well as the only entree that was vegetarian : the tagine d’artichauds or artichoke tagine, a take on a North African dish that was unfortunately bland and gave the impression it was just put together to have something on the menu. Too bad. Desserts were interesting though. And it was a bit difficult to pick as they had very nice choices. We finally went for the tarte au riz that is a rice pudding tart, the rice pudding sitting on a layer of maple dulce de leche for an added sweetness. This was a great dessert, not too sweet and well executed that I recommend if still on the menu. I should also mention their cocktails that are creative. I drank the night moves, made with bourbon, cognac, fernet (bitter) and black walnut.